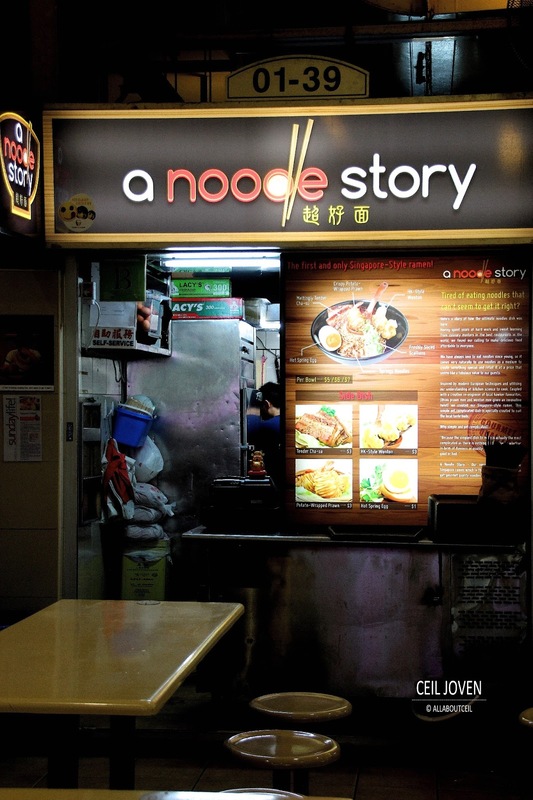 A noodle story started in February 2013. This noodle story is about 2 passionate young men met as classmate in SHATEC and came together to share their dream in wanting to serve warm and delicious foods to happy customers at an affordable price. 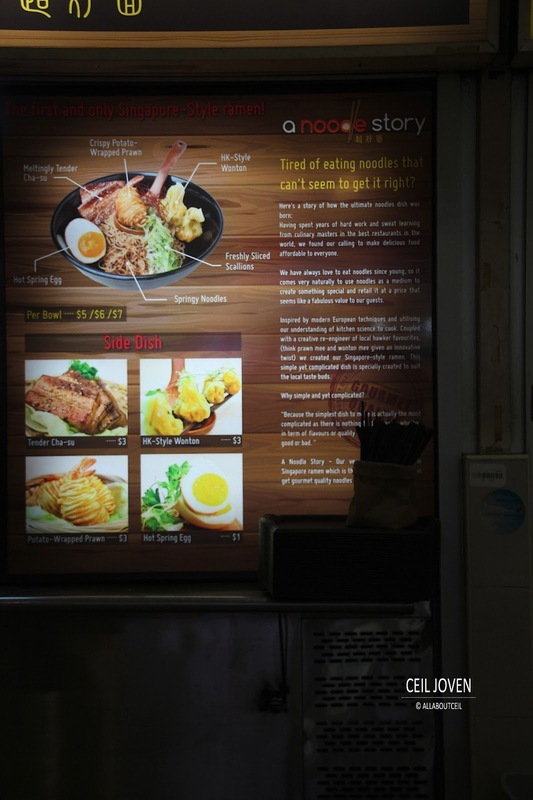 Both of them have worked for some top restaurants before they started this stall at Amoy Street Food Centre as their first step to realise their dream. They are hoping to make up the disappointment that many of us encountered by a not so perfect bowl of noodle. Here, they are looking into serving simplest dish using the modern techniques to make it possible. 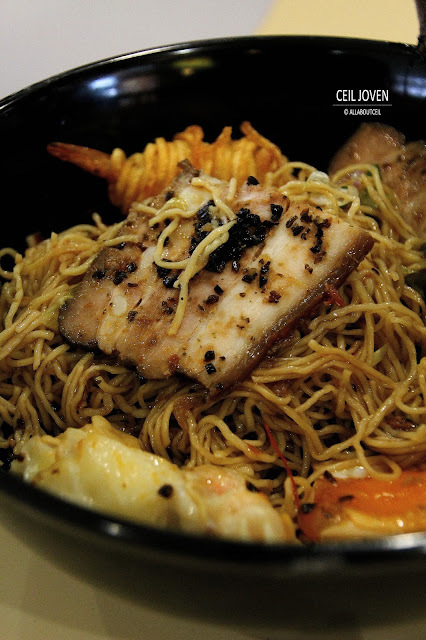 Every bowl of noodle is passionately served whole heartedly to give the best to make every cent worth. It was served to my table by one of the friendly chefs though self-service is expected. I paid up and thanks him for such initiative and attentiveness. I was impressed by the presentation. First that caught my eye is the crispy potato wrapped prawn rested on a wooden ladle. Next, was the onsen egg with a pretty looking orangy egg yolk. Then, the 2 pieces of chashu with just the right balance of fat and lean meat. Also, the 2 pieces of pump wantons there. It is the $5 portion of the egg noodle served with a lot of ingredients. 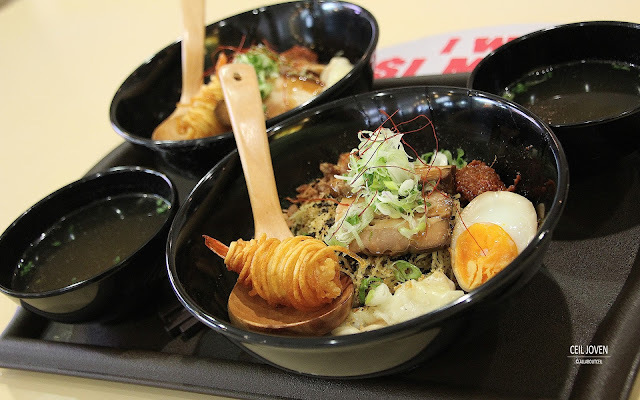 It is supposed to be the Singapore style ramen though the noodle did not quite resemble the typical Japanese style ramen but more like the mee kia that most of us familiar. The noodle served dry. After tossed it well in the lemon grass and ginger infused oil, it was a bowl of delicious noodle awaits. It was garnished by kelp and prawn dust that made of blended dehydrated prawns to give it an extensive flavor. It was served with chilli aside. I felt the taste of chilli did not enhance the flavor any further. The type of chilli used is like sambal chilli but with minimum spiciness. 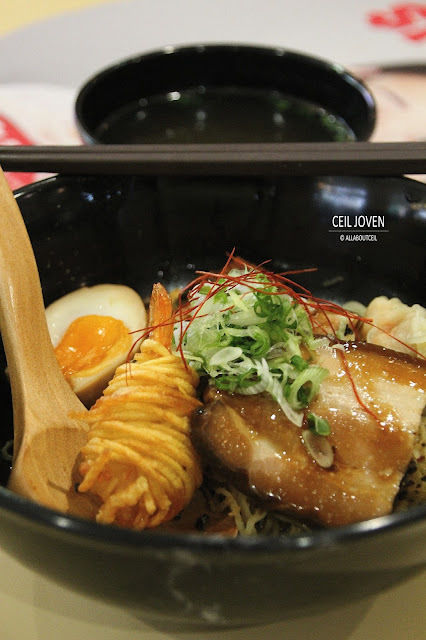 To complete it, it was topped with sliced scallions, strands of red pepper and kombu seaweed. If you want more of the crispy potato wrapped prawn, the chashu, the wantons or the onsen egg, you can order them as side dishes for $3 per serving. My first mouthful was quite an experience. It was delightfully tasty. The Hong Kong style wantons has got a good mixture of prawn and minced meat. 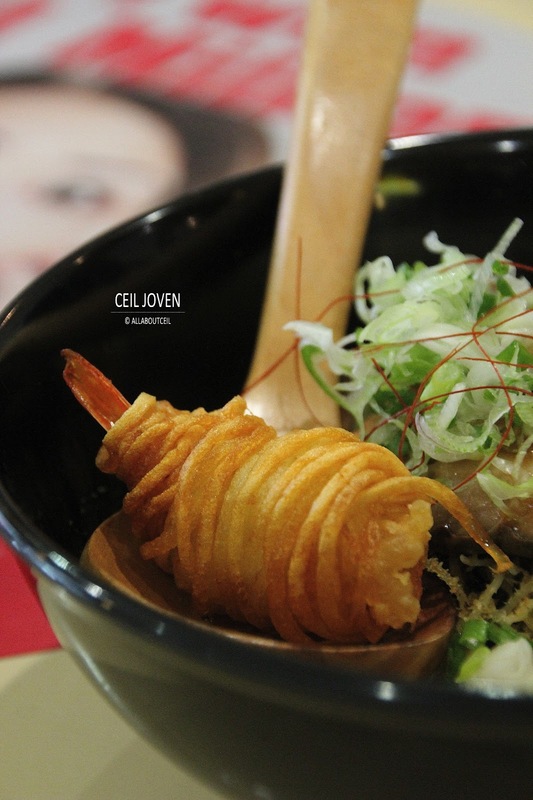 The potato wrapped prawn was freshly fried to give it the crispiness. The prawn together with paste was wrapped by strips of potato. 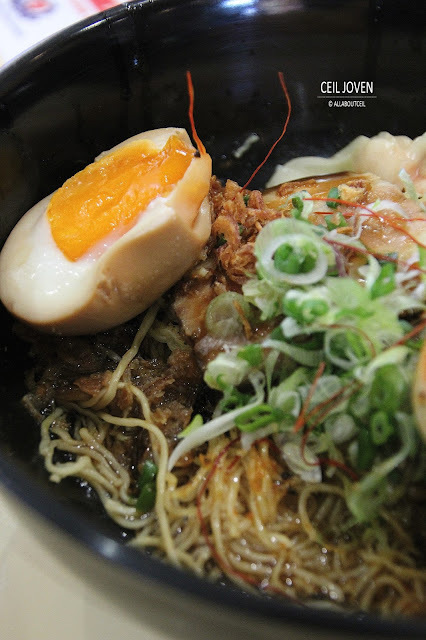 The chashu and onsen egg give the noodle a hint of Japanese touch. The pieces of chashu were of the right thickness and derived at nice tenderness, the ultimate result of sous vide. The onsen egg has got a running egg yolk that was pretty enjoyable. And, not forgetting the bowl of soup that came along with the noodle. It has got a rather slight taste of dried shrimps. The noodle is the only item on their menu for $5, $6 or $7. 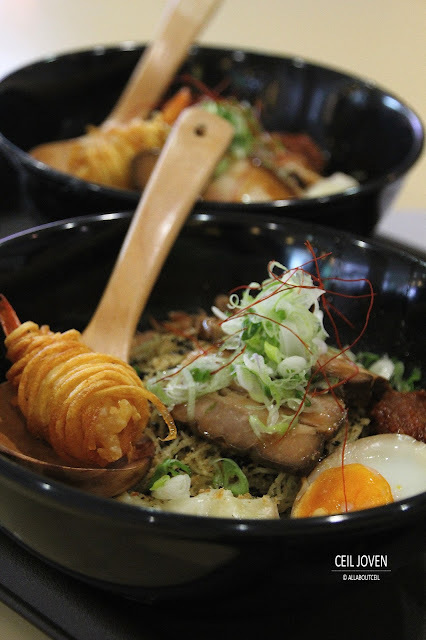 Other than the 4 type of ingredients, i can taste the amount of passion in this bowl of noodle. I truly enjoyed it, very much. 7 Maxwell Road #01-39 Amoy Street Food Centre SINGAPORE 069111.